Cambodia’s Senate passed a controversial law to regulate the country’s nonprofit sector as hundreds of people protested. Opponents say the law marks a deliberate effort by the government to clamp down on groups that have been criticizing the ruling party on an array of issues, from politics to land-grabbing to corruption. 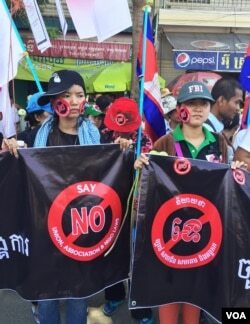 Cambodia’s Senate approved the controversial Law on Associations and NGOs, known as the LANGO, in just a few hours Friday, despite a boycott by senators from the opposition Cambodia National Rescue Party (CNRP). Given that the upper house is dominated by the ruling Cambodian People's Party of Prime Minister Hun Sen, that was little surprise. The law's near-certain passage, however, did not stop hundreds of demonstrators from gathering outside the Senate. Among them were monks, NGO workers and victims of land-grabbing who came to protest vague provisions they say give the government the power to close any nonprofit or association it does not like. The government said the law is necessary to prevent terrorism and money laundering, and insists people should not fear its provisions. The protesters do not believe those reassurances. Naly Pilorge, director of local rights group LICADHO (Cambodian League for the Promotion and Defense of Human Rights), said, “The entire law is about obligation – it’s not about legal protection, it’s not about benefits, it’s all obligation. "The most concerning is that everyone – whether you start a football team, whether you start German classes, whether you want to talk about land communities – will be forced to register. And those who are registered already, like LICADHO and other NGOs, if we violate Cambodia’s dignity or morality, we will be suspended or deregistered or closed down,” Pilorge said. The LANGO is one of a half-dozen laws – either recently passed or likely headed to parliament in the near future – that could significantly affect rights, including those of freedom of expression and freedom of assembly. The European Union, the United Nations and the United States, all key development partners, have spoken out against the LANGO; hundreds of nonprofits want it scrapped. The opposition CNRP last week boycotted the parliamentary vote on the LANGO to protest the ruling party’s lack of consultation. Pilorge said the LANGO also reflects broader repressive measures being enacted in Cambodia and the region. “Not only it’s about the next two elections, but it’s also about the trend of the government and regionally to stop civil society from expressing concerns and raising issues in the public arena," she said. "It is very much in Cambodia about NGOs serving the government – doing the work of the government – but eliminating and stopping and sanctioning those who express concerns,” Pilorge added. Next, the LANGO will be sent to Cambodia’s king for his assent, which is likely to happen in the coming weeks.